His tenure, however, has not simply carried on the legacies of his predecessors. 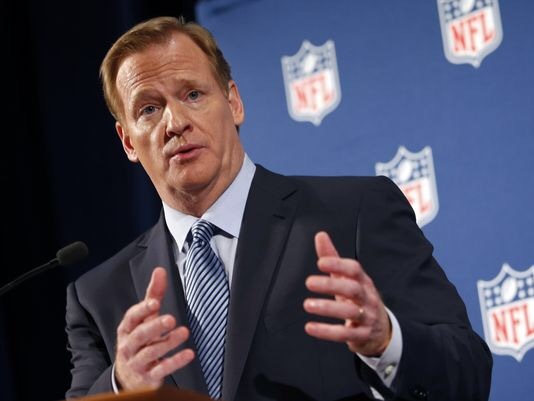 Goodell’s NFL is far different from the one Paul Tagliabue and Pete Rozelle presided over. His vision is unique and his methods distinctive, even if they represent simply an educated approximation of what his bosses prefer. Here, then, are 10 ways the NFL has changed under Goodell’s leadership — one for each year. The NFL was always a for-profit business, but its attempts to grow revenues have intensified noticeably over the past 10 years. During a 2010 owners meeting, Goodell famously set a goal to achieve $25 billion in annual revenues by 2025. At the time, the league was taking in about $8 billion per year. Forbes magazine has projected its current revenues at more than $13 billion. Most significant league decisions in Goodell’s tenure can be viewed through this prism, whether it is more London games or choosing the Rams for Los Angeles or adding a Thursday night schedule or advocating for the replacement of 25-year-old stadiums. (The Georgia Dome, opened in 1992, will give way to the $1.4 billion Mercedes-Benz Stadium in Atlanta next year.) To be fair to Goodell, this approach likely matches the aggression of his bosses, whose franchises are valued at many multiples of what they were worth just a decade ago. They expect big returns. The NFL isn’t among the largest companies in America, but its outsized public presence under Goodell has given it many of the same characteristics. It has a highly paid CEO; Goodell has received $142 million since 2011 alone. It has organized a lobbying arm in Washington to advocate for its interests in Congress, led first by Cynthia Hogan and now by Nicole Gustafson, a longtime congressional aide. (The NFL spent $1.2 million in lobbying in 2014, twice as much as MLB, the NBA and the NHL combined, and its Gridiron Political Action Committee raised $900,000.) And under Goodell, the NFL was willing to spend enough in legal fees to outlast a class-action lawsuit brought by thousands of players who held the league responsible for their declining health, specifically as it related to concussions, and crafted what legal analysts say is a favorable settlement. More recently, Goodell reorganized the league’s public relations department by hiring powerhouse executive Joe Lockhart — once the press secretary under President Bill Clinton — to ramp up its messaging. Goodell’s NFL now behaves like a big business in most every way imaginable. In a relative sense, the NFL has made significant strides in concussion policy since Goodell’s 2006 promotion. Even then, treatment of NFL head injuries took place in the wild west, a time when (conscious) players decided whether they should return to a game after a head injury. And to be frank, the issue did not appear to be a high priority until Goodell was grilled at a 2009 congressional hearing about the league’s refusal to acknowledge a connection between brain injuries and football. Since then, the league has formalized protocol for diagnosing concussions, treating them and returning players to the field. Independent neurologists now stand on game-day sidelines and work with a medical spotter in the press box. This summer, the league established a discipline schedule for teams that don’t follow the policy. Rules designed to minimize hits to, or with, the head have had a positive effect. The approach is far from perfect, and motivated players can still find a way to play with a concussion. But any objective observer would agree the league’s attitude toward concussions and head injuries is better now than it was in 2006. Goodell has made player discipline one of his top priorities, elevating fine totals and suspension lengths for violations of the personal conduct policy. He has also drawn criticism for his unwillingness to allow a true third party to arbitrate discipline appeals. But he will struggle to steer his permanent legacy away from Spygate, Deflategate and Bountygate. Two procedural questions and one rumor grew into a trio of scandals, mostly because of Goodell’s heavy and blemished investigations. When they were over, we had almost no verified evidence of what was alleged to have happened. Did the New England Patriots deflate game footballs in the 2014 AFC Championship Game? Were the New Orleans Saints really running a system to reward players for injuring opponents? Did the Patriots film opponents’ signals? (The NFL destroyed tapes that it said proved the video allegations.) Goodell was right in a sense. Part of his job is to assure the public that teams and players are following the rules and that the outcomes of games aren’t fixed. But his expensive investigations never answered those questions to anyone’s satisfaction. Instead, he drew the ire of multiple fan bases, players and some owners. In the long run, deep levels of public distrust can’t be good for business. To say Goodell has sown a damaging relationship with players is to miss the larger story. He and the owners he serves are downright union busters compared to their predecessors. Goodell inherited a 19-year run of labor peace, but it now has become routine for the league and the NFL Players Association to litigate their differences. Recent NFLPA victories in court, along with the revelation that the league held back $100 million in revenues it was supposed to share with players, have heightened the distrust. Can players trust that Goodell and the owners will abide by the collective bargaining agreement (CBA) both sides signed in 2011? Not many do. But the hard-line approach hasn’t just affected players. Remember the 2012 lockout of NFL referees? In an attempt to strike a more favorable deal, Goodell risked the credibility of the league by using unqualified replacement officials for three weeks. The lockout ended only after the disputed “Fail Mary” touchdown played out on national television, and the entire episode remains a deep stain on Goodell’s résumé. Not all of Goodell’s edicts toward players have been negative, of course. During the 2011 CBA negotiations, he signed off on a new training structure that has dramatically lessened the mandatory obligations on players. Offseason conditioning now begins in the third week of April rather than early March (for teams with returning head coaches). Teams are allowed a maximum of 10 organized team activities (OTAs) over a three-week period and no more than six hours of work on those days. Training camp restrictions have all but eliminated traditional two-a-day practices, and teams are limited to 14 full-pads workouts during the regular season. Coaches hate it, of course, and bemoan the reduction in opportunities to drill fundamentals. But it has been a huge win for players, who gladly took on the additional responsibility for making up the missed training on their own. The NFL became a true year-round sport in the Goodell era. It had already begun moving that way by 2004, when the NFL Network began airing the scouting combine in February as well as a schedule release show in late April. Goodell pushed that effort into a higher gear by expanding the draft from a Saturday/Sunday affair to a three-day extravaganza, two of them in prime time. The start of free agency was pushed back from midnight to 4 p.m. ET, a time when far more people can watch televised specials, and the schedule release — once distributed via fax — has become a frenzied event. Another former news release, the Associated Press’ annual player awards, are now announced during the prime-time NFL Honors show on the night before the Super Bowl. The NFL brand is so popular that no event is too minor to blow out. Goodell shuttered the money-losing NFL Europe in 2007 and replaced it with a plan to increase promotion of the stateside NFL through marketing and an increased number of overseas games. This year, the NFL will stage three games in London at two different stadiums and a fourth in Mexico City. All are sold out. There have been discussions about future games in Brazil, Germany and China. While the league has not given up on the possibility of a franchise in London, logistics could morph such a scenario into a “virtual franchise,” whereby a rotation of teams plays a total of eight regular-season games there. One way or the other, though, Goodell has followed through on his pledge to prioritize international growth. During its 21-year absence from Los Angeles, the NFL convinced 24 American municipalities to build new stadiums or perform near-full renovations on existing ones. The threat of relocation provided effective leverage and Goodell held out as long as possible. By the time he orchestrated the league’s return earlier this year, only three stadium-needy teams remained. The Rams got the go-ahead to move for 2016. The Chargers have the option to join them for 2017 if they cannot secure a new stadium in San Diego. And if they do get a stadium there, the Oakland Raiders will have the next option in Los Angeles. Goodell and the owners used the Los Angeles market to its fullest capacity before finally returning. « WHY ISN’T IKEA READY TO LET KANYE WEST DESIGN FURNITURE FOT THEM?